Torah and the Twelve Steps, Inc is a spiritually based drug and alcohol rehab integrating spirituality within Torah Judaism with the Twelve Step model to eradicate the underlying pain of addiction. This adult male and seperate female program is open to persons of all backgrounds who desire experiencing genuine Biblical based teachings. Wholeness, pleasure and purpose replaces the subjective need for “filling the void” whereby the desire for the substances is entirely removed. 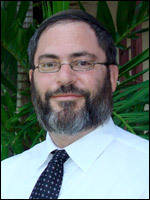 Rabbi Israel Burns, MS, MHC practiced extensively as a therapist with dual-diagnosis. He has spent thirteen years in full-time advanced theological studies in Miami and Israel. Happily married with family, he holds a Masters Degree in Substance Abuse Counseling from Nova University and has been spiritual director of leading treatment programs for Substance Abuse and Eating Disorders. SEEING EXTREME RELAPSE RATES IN SECULAR TREATMENT HE FOUNDED THIS PROGRAM, REJECTING THE SECULAR RELAPSE PREVENTION MODEL. The LIE addiction is a relapsing medical condition is utilized as an excuse for treatment failures assuming “randomness” in the relapse. All responsibility for Faith and Action taken away. Relapse is caused by a lack of spiritual growth. Torah and the Twelve Steps, Inc provides faith based full day addiction recovery programs with supervision and housing. We train rabbis and educators to help addicts and families. We demonstrate the Miracle and Power of Hashem to save lives. We prove through objective evidence no secular treatment is effective as Torah based Twelve Steps.